The roofing might possibly the most complicated stage of the entire build so far. To be honest, I hadn’t even given it much thought before deciding on a standing seam, metal roof. I guess that seeing the number of tiny houses on the web with metal roofs, just seemed to subliminally implant the message of installing a metal roof. This subliminal messaging along with that of the hardware store having a specific brand of metal roofing displayed on their wall, simply led me to choose the Westform brand of ‘prolock’ standing seam roofing. I didn’t even shop around, or check out the prices, I just blindly went ahead and decided on this brand. I ordered the roof around two weeks ago now and that was the first immense hurdle. You need to order everything at once, including flashing, trim, screws, closures, ridgecap and anything else you might need. As I’ve never fitted a roof before, knowing what you need is half the battle. I actually spent an entire hour in the store placing the order. I’m sure they loved me at Slegg. I was so nervous about placing the order as it’s not something you want to get wrong. The roofing material arrived last week and I made a point of checking off all the items, to make sure the order was correct. It seems I won an extra panel, so that’s great! I have spent hours, in-fact, days, researching roofing techniques and which way is best. Again, as with every stage of this build, the information out there is diluted, contradictory, opinionated and extremely confusing. Due to the plethora of ways to instal roofing, there was no specific ‘right’ way. However, after much consideration, I was drawn to the ‘cross-batten’ method of installing a roof. I want to take a moment here to thank Seth from Classic Metal Roofing for their email about this. The email came at just the right time to guide me towards this method. Most articles I had found, had the roofing installed on horizontal battens, but this made me wonder about water running down the roof and resting against one of the battens (also known as purlins, or strapping). Some places have the metal screwed right down onto the plywood sheathing (with the roofing membrane in-between), but an article about condensation on the underside of metal roofs, had scared me away from this. After receiving the email from Seth and continuing with a little more research, I decided to go ahead with cross batten (also referred to as counter batten) installation. 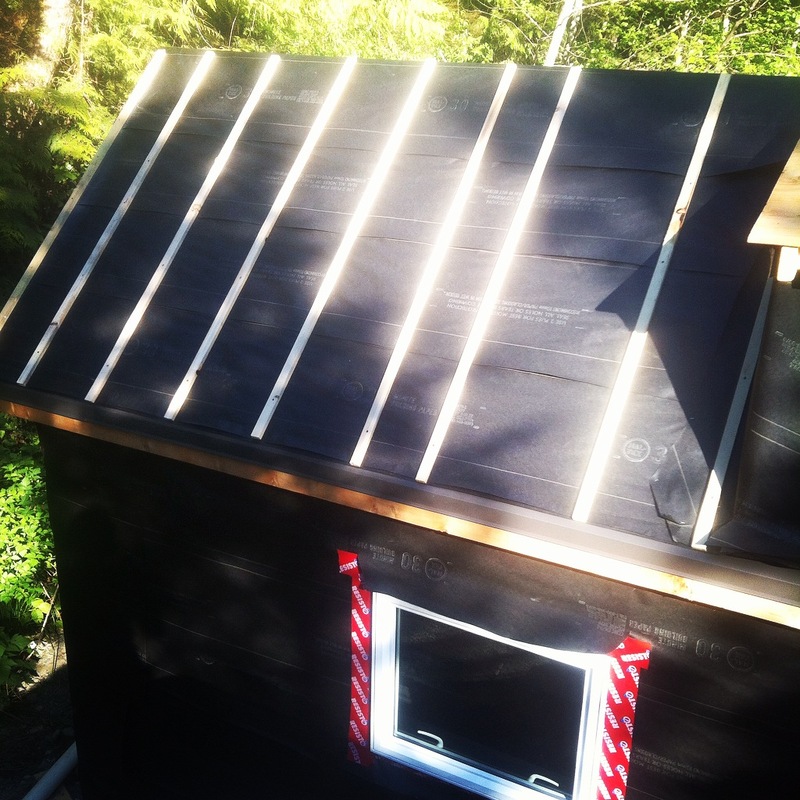 The classic roofing company also are responsible for this interesting site about tiny house roofing. It seems to be going well so far. 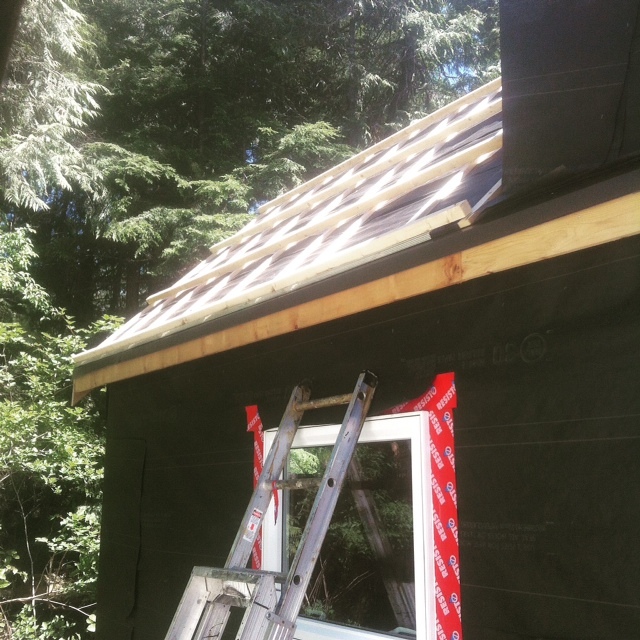 I have used 2″x1″ strapping for the vertical battens screwed down with 3″ screws into the rafters, then I have laid 2″x2″ battens as the horizontal strapping, spaced at 24″ on centre (vertically) on which I will screw the actual roofing sheets. The installation instructions from Westform, are extremely basic, however their online support via email has been very good. I hope not to bother them too much more, but am very happy with the service from Joe at Westform Metals. As I write this, I have almost completed the strapping process and look forward, somewhat with apprehension, to fitting the panels soon. I am still not 100% sure about how I am going to flash the skylight or the stove pipe, but I am hoping for the answers to come just as I need them. For now though, I’m taking a vacation and heading off to Portland, so the house is wrapped up and I’m outta here.